SAN DIEGO, CA (July 7, 2010) – Taverncraft, a subsidiary of 3 Point Entertainment LLC, today announced the debut of a new series of premium-etched glassware based on the literary masterpieces The Hobbit and The Lord of the Rings. Available both as a 16 oz. pint glass and a large 25 oz. 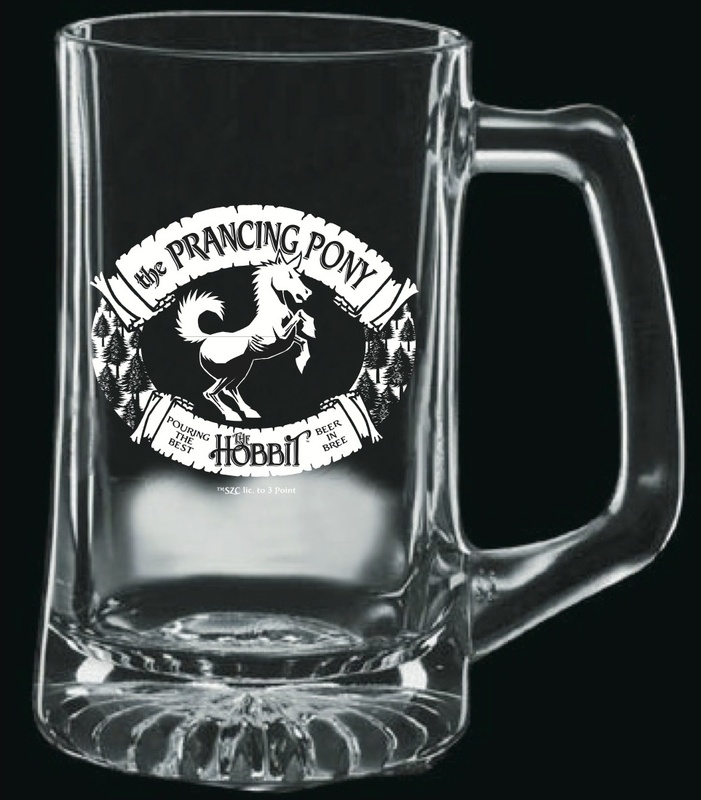 glass stein, each high-quality drinking glass is deep-etched with iconic artwork featuring two of the most popular Middle-earth taverns, The Prancing Pony and The Green Dragon. Perfect for everyday use or gift giving, these dishwasher and freezer-safe glasses are available now at hobbitsteins.com for August shipment. Pint glasses are packaged in 2-glass sets and retail for $29.99 plus shipping and handling. Each 25 oz. glass stein is packaged individually and retails for $29.99 plus shipping and handling. Additional information, images and ordering details are available at hobbitsteins.com. The Saul Zaentz Company d/b/a Middle-earth Enterprises f/k/a Tolkien Enterprises (SZC), is the holder of worldwide motion picture, legitimate stage, merchandising, and other rights in the literary works of J.R.R. Tolkien including The Lord of the Rings and The Hobbit. SZC has been producing and licensing films, stage productions and merchandise based on the works of Mr. Tolkien for more than 30 years. Its headquarters are located in Berkeley, California and its Middle-earth Enterprises’ website may be found at www.middleearth.com.